FYI: ©Copyright laws in effect throughout The Artful Mind for logo & all graphics including text material. Copyright laws for photographers and writers throughout The Artful Mind. Permission to reprint is required in all instances. In any case the issue does not appear on the stands as planned due to unforeseeable circumstances beyond our control, advertisers will be compensated on a one to one basis. Disclaimer rights available upon request. Serving the Art community with the the intention of enhancing communication and sharing positive creativity in all aspects of our lives. A.P.E GALLERy northampton, MA • 413-529-1895 Easthampton Artist, Susan Montgomery, exhibits new works of paintings, drawings, and sculpture, Mar 8 - 29. BERkSHIRE MUSEUM 39 South Street (route 7), Pittsfield, MA Bryan nash Gill: Beyond the Landscape thru May 2013. 510 WARREN STREET GALLERy Hudson, nY • 518-822-0510 Peggy reeves, “Mostly Blues II”, thru March; Jeannine r. Schoeffer, “Africa”, thru April. reception Sat Apri 6, 3-6pm. NEUMANN FINE ART 65 Cold Water St., Hillsdale, nY • www.neumannfineart.com Featuring the paintings of Bob Crimi and the custom made furniture of Joel Mark in the gallery's second group show, which opens with a reception on April 13, 5-8pm. The exhibit runs April 13 – June 2. CLUB HELSINkI 405 Columbia Street in Hudson, n.Y. “night” at Club Heslsinki: 8 pm on Saturday, March 23rd. Classical pianist, Simone Dinnerstein and folk artist Tift Merritt .The concert is presented as part of the 2013 ClaverackLanding season. LAUREN CLARk FINE ART 402 Park St, Housatonic, MA • 274-1432 www.LaurenClarkFineArt.comLauren Art and framing in the heart of Housatonic. NORMAN ROCkWELL MUSEUM 9 route 183, Stockbridge, MA • 413-298-4100 An exhibition devoted to the work of Hungarian-born artist Istvan Banyai opens at norman rockwell Museum on Saturday, March 9, 2013, and runs through Sunday, May 5, 2013, as part of the museum’s Distinguished Illustrator Series. GUIDO’S MARkET rte 7, Pittsfield, MA Susan Geller Photography Exhibit, “People/Places/Flowers”, thru the month of April. BERkSHIRE ART GALLERy 80 railroad St, Gt Barrington, MA • 528-2690 www.berkshireartgallery.com 19th and early 20th Century American & European art and sculpture, contemporary artists DEB kOFFMAN’S ARTSPACE 137A Front St., Housatonic, MA • 413-274-6669 francopellegrino.com Franco Pellegrino, thru March 31. Open Weekends 2-5PM or by appt. All Things in Paradise; March 13 through April 20, 2013. Opening reception with the artists on Saturday, March 16 from 5 – 7 p.m.
ST. FRANCIS GALLERy 1370 Pleasant St, rte 102, Lee, MA • 413-717-5199 Opening March 16, 3-6pm. Mixed media. THE ISHA NELSON GALLERy railroad St., Great Barrington, MA COLOr, MOVEMEnT AnD BALAnCE Artist David J. richardson, “Color, Movement and Balance”, April thru May; opening is April 6th at 4pm. THE OXBOW GALLERy 275 Pleasant St., northampton, MA 01060 oxbowgallery.org (413) 586-6300 POLLArD WILLOWS, by painter Gary niswonger, March 7-31, Opening 5-8 Friday March 15. The Last Waltz LIVE Memorial Hall in Shelburne Falls, MA. Saturday March 30th at 7:30PM ; Sunday April 7th at 7PM we will be at Bridge Street Live in Collinsville, CT.
“Mostly Blues II” Peggy’s artwork is on display at the gallery throughout the year. Please stop by! NEW OILS plus BLACk AND WHITE DRAWINGS AND PAINTINGS Pastels, oils, acrylics and watercolors…..abstract and representational…..landscapes, still lifes and portraits….a unique variety of painting technique and styles….you will be transported to another world and see things in a way you never have before….please come join us and experience something different. Painting classes continue on Mon Wed mornings 101:30pm at the studio and Thursday mornings out in the field and are open to all...come to one or come again if it works for you...all levels and materials welcome... Classes at Front Street for those wishing to learn and those who just want to be involved in the pure enjoyment of art and who have some experience under their belt. Perfect for those seeking fresh insight into watercolors, and other mediums. Kate Knapp has been teaching for many years, and has a keen sense of each student’s artistic needs to take a step beyond! Perfect setting for setting up still lifes. Lighting and space is excellent. Peak in to see! Kate Knapp’s paintings are also on display at 510 Warren St. Gallery in Hudson, nY. Please stop by to see all the many works of art by exceptional artists. Front Street Gallery – Front Street, Housatonic, MA. Gallery now open by appointment or chance...if you call my home phone 413-528-9546 or cell 413-429-7141. I can meet you there very quickly...I look forward to seeing you! Still young at twenty-something, Sabine’s studio has become a brand for contemporary, unobtrusive, relaxed photography in the European style. Did you have a “Sabine” experience, yet? A master of the subtleties of lighting and the nuance of background, her eye for detail provides imagery to be treasured for a lifetime. Assignments are tailored to meet her client’s needs - a remembrance for a special occasion or a logo image to create an authentic professional online presence. It is to no surprise that she is a sought-after wedding photographer, as well. Her editorial work includes book projects to photograph all imagery for “WOODLAnD STYLE” and “SHELL CHIC”, published by Storey Publishing, author Marlene H. Marshall; they can be purchased from your nearby book stores. Signed fine art prints and books are directly available through her studio. 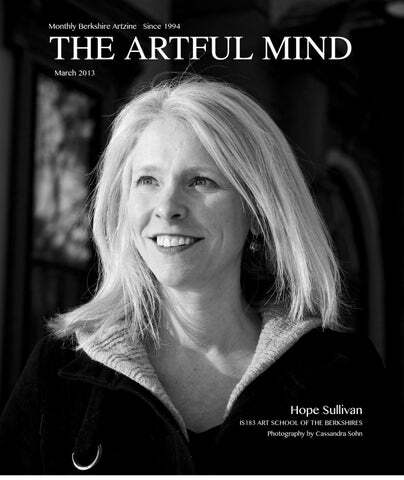 The Artful Mind has showcased her work since 1994, the very beginning of the monthly Berkshire Artzine. Photo Art Sale every weekend by appointment. Sabine is a member of The American Society of Media Photographers asmp, The International Center of Photography ICP and the Wedding Photojournalist Association, WPJA. And just in case you don’t know what to give this holiday season: how about a gift certificate for a portrait session and / or photographic art prints? Certificates can be made out in any amount and are good for seven months. Sabine Vollmer von Falken Studio: 20 Glendale Road a.k.a. Route 183, Glendale, MA 01229; www.sabinephotoart.com, info@sabinephotoart.com; 413-298-4933. A most wonderful place to be. DIALOGUE OF TWO â&#x20AC;&#x153;ART HEARTSâ&#x20AC;? Both yom Tov and Elinor share a love of God, nature and creativity. Their expression of that love is what makes the dialogue between them, you and their artwork so interesting. Please come to Good Purpose gallery and feel a creative dynamic theyâ&#x20AC;&#x2122;ve made. Their intention is that through their work, they would be able to help others and communicate the beauty, harmony and love of the Divine. Their exhibit called â&#x20AC;&#x153;The way I see itâ&#x20AC;? will be on display until April 1 at 40 Main Street in Lee, MA. With vivid color and brilliant skill, Yom Tov Blumenthal penetrates imagination. His large acrylic paintings are both illustrative and surreal. Yom Tov, which means â&#x20AC;&#x153;Good Dayâ&#x20AC;? in Hebrew, grew up in the northeast uS but moved to Israel, now studying the Torah and exploring how that will relate to his artwork and life. He is an exceptional artist who also has grown up with mild form of Autism. Initially he created art to manage his feelings, solve problems, to exorcize inner demons, if you will. now that he is so involved in the study of the Torah, he is exploring how his artwork might change and serve the message of God. Yom Tovâ&#x20AC;&#x2122;s work has softened; the images he creates became more playful and enigmatic. For Elinor, her work is an expression of her love of the Torah and God - she sees the Creatorâ&#x20AC;&#x2122;s beauty in all of nature. Elinorâ&#x20AC;&#x2122;s canvases are full of natural beauty skillfully articulated with movements and inner sound. The artists met, married and live in Tzfat - a small town in Israel, sharing their passion for the Torah and art. Their personal relationship reflects a fascinating dialog: between two people, between their art and spirituality. It is as if some parts of them talk to each other, reflecting back and force their growing awareness, shaping their purpose and ways of expression. The Art of Autism is a collaborative project that brings awareness to the general public the creative abilities of people with autism. Our plan is to do this, in part, by facilitating exhibits of their work throughout the world. By bringing awareness about the artistic gifts of people on the spectrum, The Art of Autism inspires community members, gives hope to parents of children on the spectrum, as well as adults with autism, and shifts consciousness about autism. Please join us for Art of Autism experience at Good Purpose Gallery in Lee, Mass. The show opens on Friday, April 5 and will be on display until May 27 The project combines book signings with art from local and traveling visual artists, as well as poetry, film festivals, and entertainment shows. With a database of over 250 artists, poets, authors, musicians, and entertainers from age 4 to 70, participants come from all parts of the world â&#x20AC;&#x201C; including the united States, Canada, Israel, Pakistan, India, The Philippines, Morocco, France, Germany, Japan, and England. In 2011, the book Artism: The Art of Autism â&#x20AC;&#x201C; shattering myths through the voices and art of those on the spectrum was released. The book features fifty-four artists with autism from around the world. Some of the artists in the book are well-known, such as Temple Grandin and Donna Williams. Others are struggling to make a viable career out of their passion. In 2012, her second book The Art of Autism: Shifting Perceptions was released. This book featured seventyseven artists and poets on the autism spectrum. It also included stories of love, determination, and faith. Debra Hossieni, author of the book The Art of Autism, will be in Lee in early May for a panel discussion & book signing. Her son Kevin Hossieni is one of the exhibiting artists. Good Purpose Gallery, 40 Main Street, Lee, MA. Visit www.goodpurpose.org for more information. Winter hours are 9-5 Wed-Sat, 9-3 Sunday. Someone said, “Abstract expressionism is the celebration of the medium”. That has always stuck with me for some reason. I like the idea of painting with feeling as much as skill, and I think that experience is as important as the colors on my palette. Paintings are built, sometimes arduously and sometimes easily, and you shouldn’t let your mind get in the way of your hands. At first, I painted instinctually, and have since learned the vocabulary of what I have done. I create “l’art pour l’art” as the French say, or “art for art’s sake”. My work is about color, movement, and balance, and ideally, a hybrid of the realistic and the abstract, that being: the image in the abstract, or, the abstract in the image. Masterful work celebrates the medium as well as the craft. Blues musicians found in remote pockets in the South were able to cultivate a signature sound in music like no other because of their isolation from other influences. This is the benefit of being a non-conformist, self-taught artist. I spent years working with paint and searching inward for inspiration. Eventually, I studied first, the movements in art and then techniques in painting. I created what people have called, “ignorant art”, and prior to that, I practiced primitivism. My progression in art has been natural rather than academic, straddling the line between creating and destroying. I never wanted there to be stiffness or fear in my paintings. I liked what I saw in futurism, surrealism, and abstract expressionism among many other movements in art. It was a language that I understood. I had this idea of representing everything and nothing at the same time, and that was my understanding of life. I recently painted a very large canvas pure black, just a step lighter than the darkest value. I felt the true power of black by its sheer size; but as I would find out, there could be a whole galaxy of emptiness and darkness represented in just the pupil of an eye. As I moved closer to the painting, I saw something out of the corner of my eye. I broke from my trance for a moment to see what had moved, and was suddenly face to face with myself. A mirror I had positioned next to my easel, in a clustered room, served as a portal to a place far away. For a split second I saw into my own eyes so unexpectedly. There was the vastness of space and absolutely nothing else. Then in an instant, within the same second, I was back into the body of an observer who only saw himself. An artist once said, “You haven’t painted anything until you’ve realized why you paint.” For me, it’s to go to that place, to lose myself completely, but at the same time find myself. I have always imagined art as a conversation throughout time. It speaks to us and says, “This is who we are, and this is where we are.” My artwork will be on display April – May at The Isha Nelson Gallery on Railroad Street in Great Barrington MA. The opening is April 6th at 4pm. stay alive. We talked a few hours, drank coffee, brainstormed, tapped into some important resources in the Berkshires for Hope to follow up on. Hope’s goal was for the school to get in gear and run at full throttle. There was a lot to be done! Since our first meeting, I have watched Hope take this amazing school and shape it. Watching the seeds being planted with new roots growing deep and wide— just goes to show what we can do when we apply ourselves 100% to a vision in mind and heart. What do you do at IS183 and how long have you been there? Hope: I’ve been the Executive Director of IS183, Art School of the Berkshires for just over 7 years, since October 2005. What a huge undertaking this all has been for you, Hope. Tell me how it’s all been going for you since your time of arrival at the school. It’s a big job, and will always be like that. Hope: IS183 is a small organization but in the non profit sector, leading a small organization can be a big job. And when you look at the mission of the organization I do feel like my job is very big. What we’re looking at is how to make art part of our community life – starting with the individual experience and having that proliferate in all ways expected and unexpected. Because of the importance of our mission (to enrich our community through hands-on experience in art making), we’re constantly evaluating IS183’s standing both in terms of providing critical services to the county and the way that this all interacts in our world… These big, global issues have meant that identification of opportunities that enhance our mission is a significant piece of my job. I have to be able to not only work on the ground with the staff, with people receiving services, but with the shape of what those services are. For us that means looking at art, looking at the different flavors of life in the Berkshires and understanding how we can bring these together. Our home base, Citizens’ Hall, is one example of how we do that and so are our off-site programs including Learning Through Arts, ArtsCool, Bridge and the Berkshire residency Exchange. How have the state of world affairs and the economy affected the school and your job? Hope: In a very direct way I think the state of the world has changed the requirements for what a community should be providing to its population, particularly children. What does it mean to be a community? What are the responsibilities of a community to deliver? How do we ensure that this is a place where we want to live and can afford to live? And what role does our community art school need to play to create a culture of curiosity and possibility? It starts with education, engagement and our shared responsibility to each other, to our neighbors. I’d like to see the cultural richness of the Berkshires, these (inter)national organizations, turn around and look inward at what’s going on in our community and commit to elevating the experience of the generation growing up here. IS183 is working to create vehicles for that level of engagement, through our curriculum development in schools, our outreach to community partners and through our international residency program, the Berkshire residency Exchange, which is unique for bringing emerging artists not only into our community but into our schools so that some of our most vulnerable students can have a personal experience of the world. We’re using art as a catalyst to create a truly broad, engaged and rich experience for every child and helping them to be successful and to see the many paths to being an adult. And, by doing so, we’re transforming the experience of children living in the Berkshires, including the large percentage living in poverty, and make it the best place in the world to grow up. As we do this we need to look 15 to 20 years in the future and across the world to see how to support this renaissance of activity and not only fulfill our original mission but expand well beyond the scope it conceived of to creating a model for public engagement that can be replicated elsewhere. IS183 Art School of the Berkshires: the classic, idyllic drawing studio setting with wood aisles, desks and model’s platform. Fabulous natural light, original wood floors, doors, etc. What specifically does your job entail, and the responsibilities that go along with it? Hope: My job is both management of the business of IS183 and facilitating our mission and vision, which is about as exciting as you can get. What this translates to is that day-today what I’m doing and thinking about varies dramatically. It’s one of the reasons being Director never gets old, it’s always changing! What now seems to be some of your pending goals? Hope: Our primary goal is to be a transformative force in the community by providing all community members – regardless of age, means or skill level – with the opportunity to make art. Art can elevate the experience of everyone living in the county, but art and the “world of art” has taken a bad rap. From the days of the caveman when people recorded their lives by drawing on the wall, it somehow evolved to be perceived as a stuffy, elitist, inaccessible experience for a rarefied few. That’s not what I believe, and it is the antitheses to our work at IS183. I strive to nurture an egalitarian spirit at IS183, to engage with staff, Board, faculty, collaborators and community members on an individual basis, and find common ground. We’re different people with different talents finding ways to combine our efforts for a common good, the enrichment of our community. Can you see yourself being titled as a new Pioneer? Hope: With all this in mind, YES, I can see IS183 being a pioneer organization for this region. Aside from the art classes and programs, I know you are heading towards making a great event take place for the school. What is that all about? Hope: We put on several events each year. Our annual gala was held on March 9th and it was a great success. This year’s event was the Big Bang at the Energy Vortex, an electro swing affair. Quite a title, eh? Plans are in the works now for a faculty art exhibit which will open on Friday, May 3rd. This is the first faculty show during my tenure which will have enough space to showcase the entire roster of art school talent. Thanks to collaboration with the red Lion Inn we’re taking over multiple sites in Stockbridge to accommodate the full scope of the show, it’s going to be great! We’re excited and proud to display the work of 75+ artists who offer classes, workshops, camps and other programs through the art school every year. You should come! We’re also seeking nominations for the 2013 Berkshire Arts Educator Award. This award is intended to recognize the most inspiring K through 12 educators – those who go above and beyond to inspire imagination and creativity in their students. Any Berkshire County K-12 arts educator, including those who teach outside of a formal academic setting, is eligible to be nominated. We welcome nominations from the community! Please visit our website – www.is183.org – and click on the link to the nomination form in the “What’s Happening” section on the first page to cast your vote! is mentioned online and, as it turns out, IS183 is not just an art school; it’s also an isotope! not sure that there’s any way to glean deeper meaning from that, though I’ve always thought there should be. Variants of chemical elements, various ways of engaging the community… hmmm. What necessary changes to the interior/exterior of the building did you feel needed immediate attention? Hope: When I started at IS183, the school had just merged with the community, Old Curtisville, to assume ownership of Citizens’ Hall. This gave us the ability to fundraise for capital improvements, something that was sorely needed. You could poke your finger into the exterior woodwork. It took 3.5 years to complete the exterior restoration of Citizens’ Hall. What do you find in particular endearing about the school? Hope: There are so many things - my view of the art school has transformed over the years as my focus has changed. When I started it really was about Citizens’ Hall. The energy of the building, of the studios and the artists and aspiring artists coming through the doors was and remains truly special. It’s an inspired hub in our region for engaging directly in art making - a place to get your hands dirty. now that the hub is enhanced by so much more activity, we have programs in schools across the county and we’ve just launched a collaboration with the Southern Williamstown Community Association which brings adult studio programming to north County, in another historic schoolhouse! I love that IS183 is helping to create a community where opportunities to participate in, interact with and consider art have become part of everyday life, something you see, witness and attempt during your day-to-day. If every bank president, plumber and health worker in the region saw creative activity in the course of his or her day, every day, imagine what a rich dialogue and community life that would create! IS183: A spacious room perfect for students and teachers. Oil, pastel, watercolor, drawing from the model, workshops, classes and private study. So, now I am wondering, what is a typical day like for you at work? Hope: Yesterday was pretty typical… (And apologies if this get a bit long)! I started the day at a meeting in Stockbridge to discuss collaboration with long-time art school friend, the red Lion Inn. They’ll be helping us plan the the faculty art exhibit. Following that meeting I returned to Citizens’ Hall and investigated a frozen pipe, luckily a member of the facilities committee was in the neighborhood and addressed the issue before any classes were disrupted. next I met with IS183 staff to review plans for summer in-school programs in Great Barrington and Pittsfield and to finalize an after-school program to be offered in collaboration with the Clark Art Institute in Williamstown this May. I then switched gears and proofread a press release on IS183’s new slate of Board members and some recent grant awards, did some work on the FY14 budget, confirmed a meeting in Dalton for Monday (we’re starting a program at Cranesville elementary this month), and did some preliminary outreach to faculty regarding Summer Studio programs. A prospective faculty member came by for an informational meeting, I reviewed ad sales for our summer catalog and by then it was late afternoon so I headed off to pick up my daughter at childcare, day done! process, if something doesn’t work in the moment, we can change it, and if something does work we still look for ways to improve it. nothing is static. Managing and monitoring change with humor rather than fear is a great lesson from work to apply to life generally! and draw on occasion and as a teen I played music, bassoon actually, for youth orchestras. That was a great way to travel – go on tour! I’ve also got a drum kit in the basement and can play a couple Pogues tunes on the harmonica. So… I’m conversational in many artistic media but not an expert. Makes me all the more appreciative of the talent I get to interact with every day! When do you take a break? Do you like to travel? 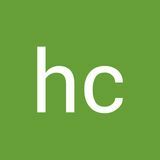 Hope: I get vacation time but since having my daughter (she’s two and a half now) I haven’t managed to figure out significant travel other than family visits. I love travelling so my wish list of places to go is pretty long… Top of mind at this moment, some cities I’d like to explore include: Buenos Aires, Stone City, Istanbul, Kuala Lumpur and Mumbai. Closer to home beach time, ski time and woods time every year is really important. Day to day I try to find ways to just get outside, get fresh air, sunlight and MOVE. That’s the best way for me to recharge. In warm months I garden, swim and play with my daughter; hike and run with my dog; during the colder, darker days I turn to skiing and hot yoga. different phonetic sounds – Chinese, Arabic, Spanish, and Hindi, as many as possible. The world is getting smaller in so many ways and being able to communicate with each other, to understand one another seems like a critical first step to being a member of the global community. Mercury is retrograde through March 17, just a few days before the equinox and change of season on March 20. Early in the month the emphasis of the sky is on creative, clairvoyant and egalitarian Pisces. We are experiencing a natural affinity for contact, healing and sharing. This is the first of three water sign Mercury retrogrades this year -- something that's pretty rare. As the month develops, though, planets move into fire sign Aries, and it's time to put all that idealism into action. That's the part that requires some initiative, guts and focus. Action is never quite as easy as the idea that precedes it, though it's necessary if you want to live for a purpose rather than getting lost in a concept. Good ideas are not enough. Being original is not enough. Aries (March 20-April 19) One potential problem with acting on your ideals is that you face the prospect of having them proven wrong. And you face the possible discovery that you don't have the will power or energy to do something you believe that you value. Yet if you don't make the effort and take the risk, you will never know for sure. There is more to this than you may imagine, because to act on your ideals you must on some level let them go. They cease to be 'ideals' and become something more tangible and practical. So the issue is one of living with a question, or striving to answer that question, learning what you learn and proceeding from there. You have long been saying it's time to get out of your head. If you really mean that, you now have an awesome opportunity. that in the present tense -- you are on the way, growing, considering and feeling out your own potential. Consider yourself a work in progress and refrain from any notion of 'expertise' -- the thing you want is the mind of a beginner, as often as you can return there. If you stray, come back to that. This is a fine moment to consider your medium- to long-term plans. By this I mean the rest of 2013, into next year and perhaps out to 2015. I don't usually advise considering the future this far in advance (especially with time moving in dog years, as it is). However you have an unusual perspective now, as if you're standing on a hilltop amidst the landscape of time. This is a three-dimensional model, rather than the usual tightrope that we think of time as being. You can see in all directions, from an elevated viewpoint. Look around; study the whole horizon. What do you see? How do you feel, looking out in different directions? This is a time in your life when the past has less bearing than ever, and your potential has more value than ever. Stop here for a moment and feel this lighting up your cells and filling your lungs. your pleasure and your ability to make contact with people you care about, this is the most dependable way to open up communication. You can only be open and honest and relate to others, if you are in contact with what you feel and what you want. That information comes from inside of you, and becomes your most dependable mode of navigating the seemingly outer world. remember, this is also true of the people you want to connect with. Sagittarius (nov. 22-Dec. 22) There is only so safe you can be, and most of that is in your mind. You may be encountering the paradox that the more you focus on security and things being predictable, the more chaotic they are. To those who are conditioned not to experience their emotions -- which pretty much counts for everyone these days, though increasing exponentially the younger you are -- any actual visceral sensation in your body can feel destabilizing, scary and even threatening. At a certain point it's necessary to question the validity of anything you consider fearful. I would encourage you to notice whether the term 'scary' has anything to do with the sensation of 'compelling' or 'makes me feel' or 'commands my attention and commitment'. If humankind can only bear so much reality, then this is the time to be superhuman. You run the risk of over-thinking very nearly everything, and this may spook you out of what hard-won confidence you have earned. I would propose two courses of action, where significant decisions are concerned. One is, make up your mind and stick to what you decide, even if you get insecure. The second is, put any big decisions on hold until Mercury goes direct on March 17, or even until the Sun changes signs on March 22. When Mercury is retrograde, often we don't need to decide things or act on them as fast as we think we do, and this particular Mercury retrograde is a very strong candidate for allowing missing information to come to the surface. If you're writing something, this is the time to do a series of drafts, allowing your theme, message and key ideas to come into focus. You may think that your life is complex right now, but you're probably a lot better off than you think. Busy is not complicated; I would save that word for commitments that compete, for obligations that you cannot fulfill or for the sensation that you have no control over your existence. Are any of these things true? The chances are you have enough of everything, though I suggest that you make some demands on your environment. If you have a need or a situation that is calling for energy, who is really involved, and where can that energy come from? There are possibilities; the more you depend on others' commitments to you, the more you will encourage a full exchange of energy. If you can do that, you will feel the abundance around you and nobody will feel exploited. You have a lot of options open to you at the moment, so many that you may want to ignore them all. That, however, is proving to be a slim possibility, as there appear to be some attractive forces drawing you in beyond your ability to resist. The one thing you want to do right now is maintain your awareness of the possibilities you have, and your ability to make choices. nothing -and nobody -- is a foregone conclusion right now. You are still in a phase where you're learning a lot about where you stand in relationship to certain others and your total environment. Concentrated information will be forthcoming through the month, though watch for one particularly powerful revelation around the time when Mercury changes direction on the 17th. You'll encounter information you need, and which can change your life. You've been through so much the past few weeks, and you may have the feeling that the tide is still coming in. Yes, you haven't reached the high water mark yet, though something else is true as well -- you're held and appreciated by the people around you. This is true despite any conflict that may have surfaced, and which may still be irritating you. I suggest you get over the idea that you have to constantly give without having any boundaries. Make the choice to offer yourself where you're truly appreciated, and where there is a high-quality mutual exchange. These things are available to you, though it would help if you see that potential. Make sure that everything you do has a role in nourishing you back. Look at every situation carefully and you will easily be able to identify that factor. We adopted a new four legged family member the first week in December of 2012. He was seven weeks old on the day he came into our lives (a newbie! ), and I’m sure most of you know how much work it is training a new pup! Coinciding with our young addition was gift giving season, and we were thankful to be very busy at our shop in town, The Berkshire Gold & Silversmith! no matter how occupied we were, I wanted to start this doggie out correctly by feeding him only the most wholesome food and treats. My neighbor Charlene Palmer has been making homemade healthy treats for her pups and they devour them, so I asked her for the recipe. When our furry boy tried one he loved it so much, that I thought it would be fun to share this recipe with you fine folks! You can use a cookie cutter, but I prefer to cut the pieces into small brownie like squares which I then cut those into 1/4 inch size squares after they are done baking (they are mighty rich!). As always, check with your vet before introducing any new foods to your pets diet. Humans aren’t the only ones with food allergies! Peace and Love to you! To all the four-legged furries, ENJOY! The St. Francis Gallery supported trip to the HOrEC orphanage in Kenya was both productive and inspiring ...the children’s art work will add a new venue to the gallery ...plus an exciting addition of new artists highlights the spring show. The March 16 opening will begin a new season of fine work and inspiring creativity. The figure, executed in various media, in both traditional expression and abstract representation will be the theme of this group of artists. The pieces range from wonderfully detailed executions to works in water color, acrylics, and oils that are emotionally vibrant paintings expressing the vitality and energy of the human form, exposed. An opening celebration is scheduled for Saturday March 16 from 3-6pm. All are welcome. And we thank you for your support in the 2013 season. St. Francis Gallery opened last December; it is a unique space for enjoying the works by many local artists—both known and unknown. The gallery, in the former St Francis Chapel, captures the spirit of art….a setting with truly wonderful light and energy. True to its name sake, St. Francis, the gallery, supports the SAWA–AWA foundation which partners with energetic and creative Kenyans – working on their own to provide needed aid and care for those in their country who struggle. These partnerships use the proceeds from the sale of art to ship supplies to Kenya via container and coordinate local people to journey there – joining up to work side by side in these productive ventures. St. Francis Gallery, 1370 Pleasant St., Route 102, Lee, MA. Gallery hours: Fri – Mon 11- 5:30. 413-717-5199.
regular exercise is an essential component of optimal health and functioning. Conscious Exercise with Sharon True, owner of WholePerson Movement, takes exercise to a whole new level. In the personalized one-on-one workouts she creates in her Pilates studio, she guides her clients to become masters of their own body movement. They learn to become conscious of the inner experience and process of doing an exercise, as well as of its precise outer form. Conscious Exercise workouts stretch and strengthen muscles, promote concentration, reduce stress, and deepen understanding of the body. True has recently completed training in a variant of Pilates called Pfilates, (Pelvic Floor Pilates, pronounced Fih-lahtees) which focuses on conditioning the muscles of the pelvic floor. Pfilates helps with pelvic floor disorders such as incontinence, organ prolapse, sexual dysfunction, weakness as a result of abdominal surgery and more. As an added benefit it strengthens the lower body and improves posture. Pfilates is an excellent companion to the regular Pilates workout which has always focused on working “from the inside out.” True applies her Conscious Exercise approach to Pfilates work with clients, coaching them to gain mastery of these often-neglected muscles. Currently she teaches a homebased program of Pfilates exercises to students in 6-week workshops as well as to private clients. Pfilates is a handy “package” of 10 exercises that can usually be learned in 3— 6 lessons. It includes a kit that supports people in doing a home practice, containing a workout DVD, a booklet, and a Pfilates ball. To be added to an email contact list about the next Pfilates workshop, call or email Sharon True at the number below. True is a registered somatic movement therapist, certified Laban movement analyst, and a certified Pilates and Pfilates instructor. She has been teaching Pilates-based workouts for over 15 years, first at Canyon ranch in the Berkshires and then in her own fully-equipped Pilates studio in Great Barrington. These years of teaching, together with her commitment to continuing her own education, give clients the benefit of a vast array of experience to effectively address their goals and concerns. She is an expert partner and guide in the discovery of an exercise program that works and is a pleasure to do. Call to learn more about Pfilates, now a component of Conscious Exercise workouts with Sharon True. Contact her at sharontrue@roadrunner.com or phone 413-528-2465, 9 AM-9 PM. The St. Francis Gallery supported trip to the HOREC orphanage in Kenya was both productive and inspiring ...the children’s art work will add a new venue to the gallery ...plus an exciting addition of new artists highlights the spring show. An opening celebration is scheduled for Saturday March 16 from 3-6pm. Slate Valley Museum, Granville, Ny “Slate as Muse”, national Juried exhibition June 6 - nov 1, 2013. Curator: Serena Kovalosky. Slate in a variety of artistic mediums and styles. UAG Upstate Artists Guild, Albany, Ny The Lay of the Land Show, featuring landscape artwork in all media. This is a national show. May 3 24. deadline: April 14, 2013. upstateartistsguild.org The EGG Performing Arts Center in Albany (Ny). Children’s Call for Performances of LA BAYADÈrE Ajkun Ballet Theatre is looking for enthusiastic young dancers (Pre-K to Young Teens) to perform alongside the Company in its summer production of La Bayadère.rehearsals and performances will run from July 29 throughout August 10, 2013 at Participation in new York City performance (August 16) is optional. Early registration Fee is $165 (including $65 registration Fee to cover insurance cost and tuition of $100) if children sign up by April 15, 2013. www.ajkunbt.org. Acclaimed artist Nicole Peskin is now offering sculpture and welding classes in her Stephentown, nY Studio. Individual and groups welcome. Please call nicole @ 518 788-0204 for details. Someone who can professionally stretch canvases. Great Barrington area. 413-854-4400. Message Board: Deadline for submission is up to the 15th of the month prior to publication.